Salomone (or Salamone) Rossi is one of the very few Jewish professional musicians of the baroque era who was able to explore his talents as a composer. In most countries in Europe many restrictions were imposed upon the Jewish communities which were often forced to live in ghettos. That wasn't any different in Mantua. It was due to Rossi�s close connections to the court of the Gonzagas in Mantua, where he was born and died, that Rossi was given the privilege of going outside the ghetto without having to wear a yellow star. He got experience as a singer and violinist under Monteverdi, who worked in Mantua from 1590 to 1612. The good relationship with the Gonzaga court is also reflected by the fact that several of Rossi's publications were dedicated to members of the court: both his book of canzonettas (1589) and the first book with five-part madrigals (1600) were dedicated to Duke Vincenzo of Gonzaga. Rossi's sister also took profit from this connection as she served the court as a singer - known as 'Madama Europa' - making her the only professional Jewish singer of her time. She sang the title role in Monteverdi's now lost opera Arianna. This disc contains the complete book of madrigals for four voices, which was published in 1614. Most madrigals in it were probably written around 1600. Indications for this are the writing in four parts - which was out of fashion at the time of publication - and the frequent use of texts by Guarini, most of them from his play 'Il pastor fido', which was very popular at the Mantuan court around 1600. Stylistically they are more connected to the madrigals written in the last decades of the 16th century than to those of the early 17th century, by the likes of Monteverdi. And although this book contains a part for basso continuo, it is not indispensable, as is shown by the fact that several madrigals are performed here with voices only. It is difficult for those who don't know Italian to hear in what way Rossi sets words to music, since the booklet doesn't contain a translation of the lyrics. 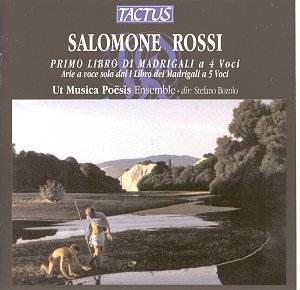 But even so it is possible to enjoy these madrigals, and in some cases the illustration of the text is obvious, like the serenity at the beginning of 'Dolcemente dormiva la mia Clori' or the grievous setting of the first lines of 'Ah dolente partita'. In addition to the book of four-part madrigals the ensemble has recorded six arias from the first book of five-part madrigals of 1600. These pieces could be performed either with five voices or with solo voice and basso continuo, which is how they are recorded here. This alternative scorings are an indication that these airs are not full-blown monodies, which were in vogue in the first decades of the 17th century. In comparison with monodies these airs are less dramatic and also less adventurous in regard to harmony. Five of them are again on texts by Guarini. The ensemble is giving a fine performance of these madrigals and does them full justice. The singers all have excellent voices, which blend very well. The instruments give modest support in the four-part madrigals, but a more elaborate role in the solo pieces. These are performed well, but the soprano and the tenor are a little too bland and careful, for example in regard to dynamics and ornamentation. The contralto is the most expressive of the three. The disc ends with a madrigal sung by eight voices. I don't understand the reasons for this, but it is quite beautifully sung and provides a pleasing final chord. I have really enjoyed this recording, which I also find interesting from a historical point of view. It's a shame, though, that the lyrics are not translated. And a duration of 46 minutes is hardly acceptable for a full-price disc.